Our Old Fashioned Recipe is remarkably similar to our recipe for good emails. While celebrating the holidays here at JangoMail HQ our “bartender” Ryan served up some delicious Old Fashioneds. After a while we couldn’t help but notice that the recipe for a good Old Fashioned was remarkably like the recipe for a good email. It may have been the Old Fashioneds talking, but we thought we’d share! 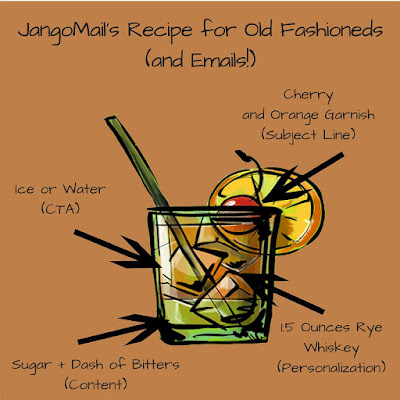 Good Old Fashioneds and good emails both start with the right ingredients. The garnish on an old fashioned is like the subject line on an email. It’s the first thing your customers see, and determines if the message gets opened. Garnishes, like subject lines can be fun and attention grabbing! Muddled sugar and a dash of bitters is the content of your message. The balance between sweet and sour is the same as your image to text ratio. Make sure to include text with your images, it will help your message display properly and will improve deliverability. The whiskey is like adding personalization, it’s attention grabbing and will make the recipient feel warm and fuzzy. Finally, the ice or splash of water, which is like the call to action of your email message. In an old fashioned the ice releases flavors in the whiskey, pulling the drink together. The call to action on your email will pull the content of your message together. Having a hard time dealing with the end of the holiday season? Enjoy an Old Fashioned based on our recipe below. 1) In a rocks glass (or lets face it – any glass you want) place a sugar cube and a couple dashes of bitters. Muddle with a muddler or a spoon. 2) Add a couple of ice cubes to the glass. 3) Pour in 1.5 ounces Rye Whiskey (our personal favorite is Bulleit). 4) Cut an orange slice and rub it around the rim of your glass then drop in, add a maraschino cherry.